In order to increase the range of motion in your neck, you need to stretch your neck through a full range of motion. These stretches will help to normalize the lengths of the muscles and potentially help to increase the fluid in the discs. In order to achieve good results, do the following exercises at least twice a day. Flexion. Sit nice and straight, take a deep breath in and bring your chin towards your chest as you inhale. Inhale as deeply as possible and bring your head as far forward as you can, then slowly exhale and come back to the neutral position. Extension. Inhale deeply and tilt your head backwards as far as you can comfortably while you are inhaling as deeply as possible, then slowly exhale and bring your head back to the full upright position. Series of Four. The next four steps will bring your head through an X range of motion. Imagine yourself looking at the top of your head from above, and the figure you will create is an X shape. The first range of motion will have you stretch the muscles in the back left side of your neck, and this will be done by having you inhale and bend your head forward and to the right at a 45 degree angle. This is done precisely as the previous exercises, having you inhale while you go through the range of motion to the full extent and then exhale when you go back to neutral. 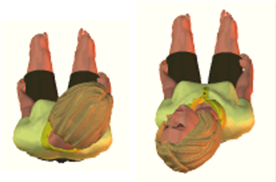 For the first series of four you will inhale and bend as far forward to the right as possible at a 45-degree angle, and then exhale and come up to neutral. For the second step you will inhale and extend your head back and to the left at a 45-degree angle, inhaling down, exhaling up. For the third step you will inhale and breathe, bending your head forward and to the left at a 45-degree angle, coming back to neutral as you exhale. For the final step you will inhale and bend backwards and to the right at a 45-degree angle. Lateral Bending. Sitting nice and straight inhale and bring your right ear towards your right shoulder, exhale and relax your shoulders, return to neutral, repeat on the left side. Rotation. Inhale and look as far as you can to your left over your left shoulder, exhale and come back to center. Then inhale and repeat on the right. Sleep - How much and at what age?